This week was The Boy’s 9th birthday and everything that accompanies it. He’s beginning to grow out of some kid rituals, and we’ve had to accommodate accordingly. He still wanted cupcakes brought to school, but he informed us that parents aren’t there when they’re passed around. Not long from now, he’ll probably be walking to school without us as well. We’ve also tried to set our party expectations properly. We knew we again wanted to have something small, around 9-10 kids, but the past two years didn’t quite come off as expected. Experience has taught us that it is possible to get 10 girls to focus for an hour on fine-motor tasks, but with boys you can pretty much forget it. This time, my lovely wife and I tried to put ourselves in the minds of nine-year-old boys. I suggested we take everyone to a shooting range just across the river in New Jersey, with real guns and everything, but then I put myself in the minds of the parents of nine-year-old boys and thought better of it. * We started thinking about a laser tag party instead, and it turns out that a few of those laser tag/paintball/arcade places still exist, including one somewhere out in Queens. Still, though we didn’t need to worry about live ammunition, we nevertheless had to get the partygoers to and from a place we’ve never been to in a neighborhood we know nothing about. Sadly, we abandoned the idea of the kids and guns altogether. My wife suggested, with the ease and excellence that always attends the obvious, that we just treat everyone to mini-golf at the pier close to our building, followed by pizza and cake at our apartment. Done and done. It was the right choice. The afternoon was hot, the pier a busy runway for the sun, but the kids didn’t seem to care, or only pretended to care for the rich comedic potential. (We brought one of those fan/spray bottles that got passed around and used a lot.) I attempted to supervise with mixed but expected results. The kids are old enough to pretty much run themselves, and I only had to tell them every now and then to get off or out of something. Q was there, too, playing the course behind the bigger boys with her best friend (who happens to be the sister of The Boy’s best friend) and her best-friend’s younger brother. Everyone had fun easily, it seemed. 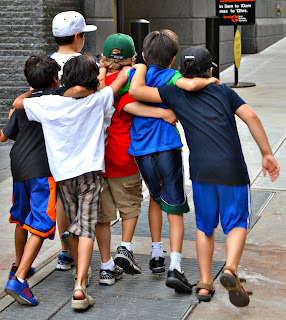 As we made our way from the pier to our apartment, the boys were still free enough of self-consciousness to all link up in a line, arm over neck, a wave of noise and energy that never seemed capable of breaking. My wife made a killer cake as always (see above). 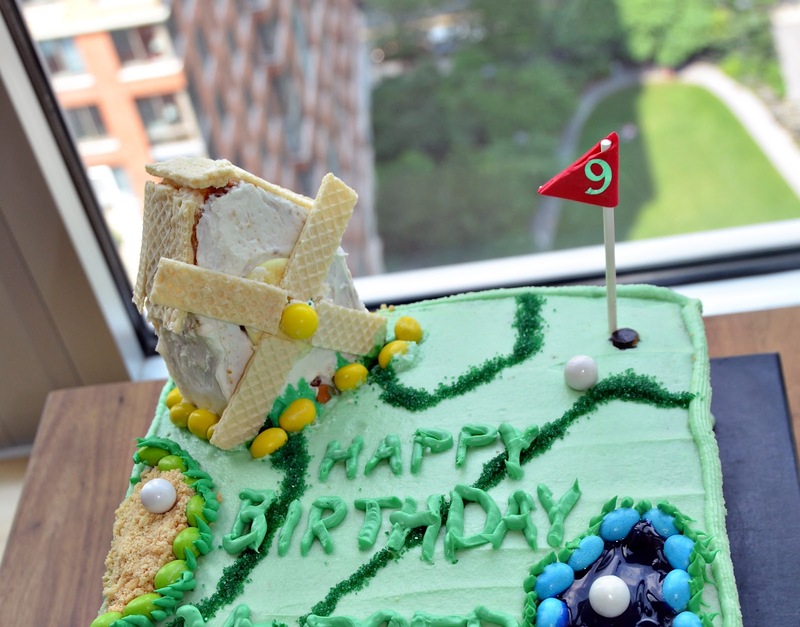 At first she wasn’t sure how to represent the golf theme, but after some Internet browsing and stumbling across a small tub of gel icing she was in business. 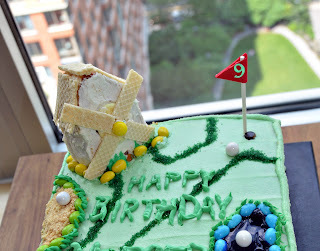 It turned out remarkable in both look and taste: a buttercreamed mini-golf hole that included a water hazard (gel icing), a crushed cookie sand trap, a windmill, a chocolate chip for a hole surrounded by gumball golf balls, and a flag that Q helped make from a lollipop stick and folded red foam. The Boy called dibs on the windmill right away. As their parents arrived, we sent kids away with a light-up foam stick** and a book. Reactions to this party favor were telling. One kid asked if he could have two of everything before he heard what everything was. Another asked me what the goodie bag was long before we were giving them out, and his interest dissolved when he heard that reading was involved. The Boy’s best friend, however, said “Totally awesome!” when he saw the pile of books and “White Fang, yes! I wanted to read that!” when he was handed the one we had reserved for him alone. No need to wonder why they’re best friends. Gifts usually reflect people’s perceptions of the recipient, and this year’s seemed pretty accurate. His friends mainly gave him gift cards for various bookstores or books outright, along with a few LEGO sets that The Boy clicked together in minutes instead of hours. (He’s a varsity-level brickman now.) We got him, among other things, a Swiss Army knife, because he can handle a thing capable of serious cutting and sawing (including oneself). His sister insisted on giving him a white bathrobe — totally her idea — which he loves to lounge in with a book after a bath. He is no less a thing of wonder now than when he arrived early nine years ago, and perhaps even more so. 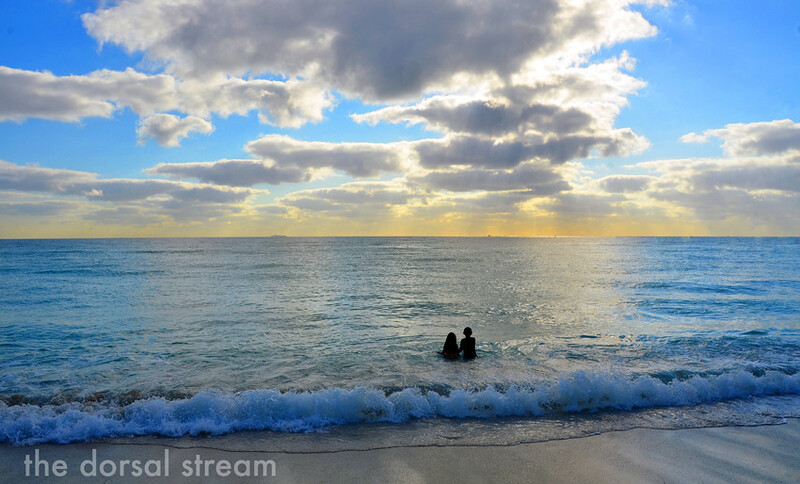 Bits of him seemed set at the beginning — yearly photos from the beach show how he approaches the ocean from the same stance over the years, and his lean frame even now like a long shadow cast by his infant body — but much of him, of course, is still in the making. Thinkers are mediators and reveal themselves in being between. We take in the world, and it gets broken up and bits of it lodged in us and spun together and out again at new angles. The Boy has become a fascinating mediator in his own right, quick- and quirk-witted, expressive, drawn to the arcane and the encyclopedic. *** He cares about most things deeply, which can lead to disappointment (often in himself) but also to loyalty and value. I have come to respect how he appreciates things. At the end of his day, we went in to wish him good night, a wish no less genuine for being routine. He himself wasn’t ready to end the day just yet, and he slid over in his bed, patted the gap he just opened up, and said to his mom with an excellent mix of love and joke, “There’s always room for someone special.” If she hadn’t wanted him to get some sleep, she would still be there now. Happy birthday, son. We love you, and we’re proud of you. *The minds of other parents, in any event. And, okay, 9 armed 9 year-olds may very well be a questionable idea. The Boy and I will have to go on our own in a few years; I trust him with a gun. **Resembling a golf club, sort of. Party favors are a terrible idea and a pain but apparently pretty much unavoidable. ***Just ask him about Minecraft, e.g. I'm always in awe of your wife's ability to bake and decorate those amazing cakes!